The right to protest peacefully is not in doubt. The wisdom is. One of the most frequent reactions to criticism of protests and advocacy of constitutional means is “Do you mean to say protests are unconstitutional?” The question has been raised frequently enough so it is important to answer it. Ambedkar calls these actions “unconstitutional methods“. He does not say that they are unconstitutional. There is a difference. No serious person will deny that Indians have a constitutional right to protest. Article 19(1) explicitly guarantees as fundamental rights the freedoms of speech, expression and peaceful assembly. The constitutionality of peaceful protests is therefore unquestionable. The question, though, is not whether we have a right to protest or not. The mere exercise of liberty is neither an indication as to its wisdom nor to its efficacy. The question is therefore, about the wisdom and the efficacy of particular actions and their consistency with constitutional morality. This is the crux of Ambedkar’s argument. For instance, praying to the Almighty is a constitutional act. Sleeping over it is a constitutional act. Protesting peacefully is a constitutional act. Civil disobedience is a special case of peaceful protest, for where it involves disobeying laws of the land, it is an illegal and unconstitutional act. None of these are constitutional methods. What are constitutional methods? The full answer deserves a book-length treatment. In short, constitutional methods involve engaging the executive, legislature and the judiciary. Through representations to government officials, through persuading and working with legislators, through voting and through actions in court. These methods are regularly used, do work and in fact deliver the most substantive changes. But there is a curious asymmetry in terms of their standing in the public discourse. While protests and ‘unconstitutional methods’ are romanticised and have a reflexive public appeal, their actual achievements fade in comparison to those achieved by constitutional methods. As Rohit Pradhan asked in an article in Pragati, what are the achievements of Jayaprakash Narayan’s “total revolution” of the mid-1970s? Violence fares even worse. No insurgency has succeeded. We await rigorous empirical evidence but it does appear that change through politics, parliament, legislatures and courts has a much better record on delivering lasting change. Anupam Kher, who was part of the celebrity set that supported Anna Hazare’s hunger strike, is alleged to have criticised the Constitution (drafted under Ambedkar’s chairmanship) on television. His exact words are in dispute but members of the Republican Party of India—a party once-led by Ambedkar—decided to take the decidedly unconstitutional route of vandalising Mr Kher’s house to protest the insult to the Constitution. The Sanvidhan Bachao Manch (the Protect the Constitution Platform) of Mumbai has correctly arrived at the conclusion that “The Lokpal would be the ultimate authority if the bill is passed. He would be above Parliament and the Judiciary which challenges the basics of democracy.” So they have decided to organise a peaceful protest rally at, well, August Kranti Maidan, on April 14th, Ambedkar’s birth anniversary. Sunday Levity: What did you learn from Gandhi? The father gathered the two little girls around him. 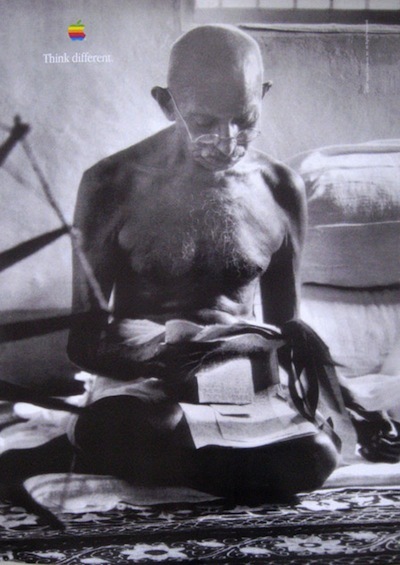 Since they had disturbed him while he was reading a book on Gandhi, he decided to tell them about the Mahatma and more specifically, why he had a large framed photograph of the man in his study. So he told them the story of India’s independence and why it was unique among all such struggles. He told them that non-violent struggle, “not listening to the orders of the bad guys” was about thinking different. And if they looked carefully, they’d see “Think Different” written at the top right corner of the said photograph. It figures, the father thought. Author Nitin PaiPosted on 20th March 2011 20th March 2011 Categories Aside, Public PolicyTags constitutionalism, Gandhi, grammar of anarchy, levity1 Comment on Sunday Levity: What did you learn from Gandhi?